What is the HudsonAlpha Tech Challenge? The event will be held at: HudsonAlpha Institute for Biotechnology, 800 Hudson Way, Huntsville, AL 35806. A special kickoff event begins Friday, February 22 at 4:30pm. Come meet some of the other participants, build your team, and talk with mentors (optional). The Tech Challenge begins Saturday, February 23 at 8:00 AM and will wrap up Sunday, February 24 at 7:00 PM. HudsonAlpha is passionately exploring and growing the knowledge and possibilities of genomics to generate new discoveries. An event in which a large number of people meet to engage in collaborative computer programming, visualizations and more. Often a standard visualization schema for a technique is key to scientists from around the world interacting and understanding results. In this challenge, teams are asked to create a standardized visualization tool using multiple .BED files that are created when determining the likelihood of two locations within a DNA sequence physically interacting. Digital activities, apps, online interactives, and serious games allow for HudsonAlpha Educational Outreach to be have an impact internationally with touchpoints in over 200 countries around the world. This challenge requires teams to use augmented reality to create an app to gamify a scavenger hunt through the human genome similar to walking through McMillian Park on the HudsonAlpha campus. One of the most used tools for diagnostic and predictive medicine is a family history. In this challenge, teams must use blockchain technology to not only store family history information for an individual, but also combine individuals from the same family together to create a reconciled collective family history for the entire family. Power of work can be ignored in this challenge but special attention to chain of custody, privacy, and security of data are of the utmost importance. Have a question about one of the challenges or the hackathon in general? Join our Slack channel! Impact - How much impact (quality and quantity) can this solution have? Does this solution address the problem in a highly significant way? Creativity - How creative is the team’s approach? Is the solution new? Does the solution represent something that isn’t being addressed by the market? Complexity - How much progress did the team make during the event? Did they start from scratch or build on an existing solution? Product - How user friendly is the technology? How fully formed/mature is the idea? Presentation - Did the team effectively communicate their solution? Did they tell the story of the project and why it is important in a compelling way? How well did they respond to questions from judges? Follow the steps outlined below to get ready for the event ahead of time. The early bird gets the worm, click here to signup for the event now. We can't wait to see you at the event, don't forget your laptop! * There are no limits to the size of teams, but we find that teams of 3-5 people work better for hackathons. Also, only 5 people per team will qualify for prizes if they win. * Participants must sign up for the event in Eventbrite and sign all of the waivers in order to to participate. * Participants may come and go as they like during the event. However, high school students must depart by 11:00pm Saturday night and may return at 6:00am Sunday morning. * All code must be created during the event. Use of open source libraries are allowed as long as the project is publicly available. Use of commercial software is also allowed. * Use of design mocks or wireframes will not be allowed during the presentation. We want real working software and apps. * Presentations will be strictly limited to 5 minutes with an additional 2 minutes for questions from the judges. * Participants must provide their own laptops, and mobile/tablet devices for use during the event. * Come on your own or create a team. We also want to encourage collaboration among attendees so if you find a team or person with a valuable asset to support your idea/concept, feel free to team up when you arrive. * External hard drives are permitted for the hacking event itself. If you want a power strip bring it! If these FAQs don't answer your question, please reach out. 1. What is the HudsonAlpha Tech Challenge?? The HudsonAlpha Tech Challenge is a hackathon hosted by the HudsonAlpha Institute for Biotechnology. During this two-day event, teams take on exciting challenges in biotech and attempt to solve those challenges through innovation and creativity. Participants will have the opportunity to learn more about some of the new frontiers in biotech, and work collaboratively to create solutions. High school students, college students and adults interested in taking on challenges are welcome! There are two categories of teams: high school and college/adult. You don’t have to be a member of a team to sign up. We’ll make sure to get you on one! 3. I don’t have a team. Now what? It is not necessary to be a part of a team entering the HudsonAlpha Tech Challenge. At the beginning of the event, we will have a team-building exercise in which you can identify the best “fit” for your interests and skills. 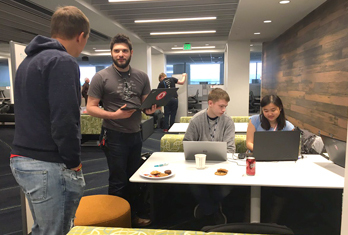 You also can choose to work independently - but hackathon participants say half the fun is the collaboration and creativity that occurs within a team dynamic. 4. Where will it take place? The HudsonAlpha Tech Challenge will take place at the HudsonAlpha Institute for Biotechnology, located at 800 Hudson Way, Huntsville, AL 35806. Participants will have access to several large workspaces on the first floor of the institute. 5. Why are you hosting this event? Good science comes from a combination of a solid background of knowledge, a creative idea, and the ability to work with data. Increasingly, science problems are being solved through the application and manipulation of big data. 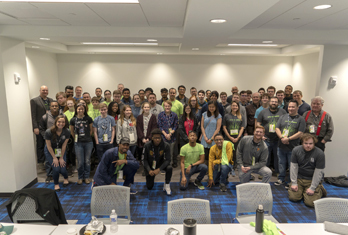 The HudsonAlpha Tech Challenge is a great opportunity to introduce the coding community – and students – to genomics, genetics and the future of biotechnology. 6. Does it cost money? We are charging $10/person to participate. This covers all food and beverages, a T-shirt, swag, and other fun stuff. 7. What is genomics and biotech? At it’s core, biotechnology uses biological processes (organisms, proteins, enzymes, genes) to create or enhance products that impact life. Modern biotechnology is powered by our understanding of DNA: specifically how genetic instructions create the building blocks of life and that changes in those DNA instructions alter physical characteristics associated with human health, agriculturally important plants and livestock and bio-based sources of energy. Today’s technologies generate enormous amounts of genetic information, requiring new tools to organize, analyze and visualize this data. 8. What if I don’t know anything about biotech and genetics, or writing code? Can I still come? Absolutely! Learning is a big component of the HudsonAlpha Tech Challenge. We will offer workshops on the science to get you up to speed. Also, mentors will be available on and off throughout the two days to offer advice and answer your questions. The challenges will require a variety of skillsets, so if writing code isn’t one of them, don’t worry. 9. Do you offer travel stipends? Unfortunately, we are not able to offer travel stipends at this time. Adults (no high school students) are welcome to spend the night so they may continue working at whatever hours suit them best. Bring a sleeping bag, a pillow, and toiletries. A quiet room will be available for sleeping or napping as needed. We do not have showers or bathing facilities in the building. 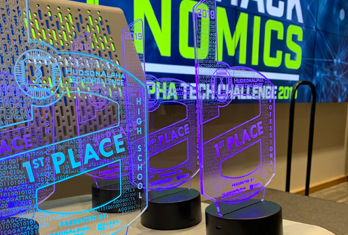 High school students will be required to leave the HudsonAlpha campus by 11:00 PM Saturday night and may return to the Tech Challenge at 6:00 AM Sunday morning. 11. Who will be there? Students, professionals, scientists, software developers and more. 13. Will the media be there? We are providing several windows for media to cover the event. HudsonAlpha and Urban Engine staff will be publicizing the Tech Challenge through social media channels. Additionally, HudsonAlpha communications staff and Urban Engine staff will be taking photos and video to document the event. Participants will be required to sign a release form. Minors will need the signature of a parent. 14. What is Urban Engine? 15. What can I win? 16. I still have a question. Who can I contact? We hope to see you at our 2019 Tech Challenge. 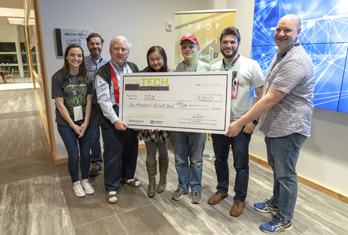 HudsonAlpha wants to inspire creativity through collaboration, and energize the current and next generation of problem-solvers to conceive and construct innovative solutions to biotech challenges.